Herself has just broken the news. She HAS STARTED UP HER OWN BLOG !!! Aaaagggghhhh!!!!! Apparently when I was down in the village the other day, she got in touch with Ron, and the traitor set her up. She has called it GrannyLostThePlot.com. At least she got the name right. I don’t know what she intends to write about, but if she tries to give “her” side of the story – it’s a pack of lies. I will deny everything. And I’m going to kill that b*st*rd Ron when I see him. She may keep to her own side of the fence but I doubt it. This could end up with a lot of blood on the walls. You’re in for it now Grandad! We might have to choose sides! 🙂 Will the daughter get in on the action? Anyone who changes sides will be deemed a traitor, and will be banished from my feedreader. They will furthermore be the target of malicious comments on ALL their posts. Strangely enough, I am trying to persuade the daughter to take it up. She is a great writer. She has bad access to the Internet at the moment but will hopefully be moving to a house with broadband later this year. Would it be a record to have all the members of family all blogging against each other? New category in the Blog Awards – Best Family!!! I am laughing my arse off,a blog and ebay you are in it now. Oh bloody ha ha!! You can laugh!! My life is as good as over. On an slightly related matter do you have Ron’s number. I hate my blog. I feel like the kid at school who had to wear the SVP clothes. Everyone else has cool links and images and stuff. Are you serious? After what he did to me? I’m going to ride the proverbial fence for now. Your blog is a daily read for me but that story of how herself got her title was too too funny. 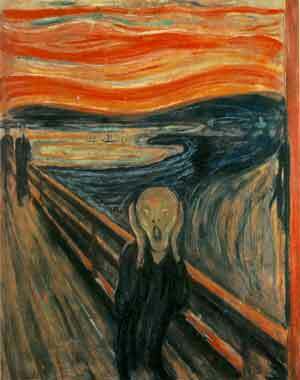 Nice job working Munch’s The Scream in there. But is it really that bad? How on earth have I missed your blog..I’m ashamed of myself for being away for so long…mind you, I’m signing up for herself as well 🙂 and I’m all in favour of a best family blog next time round. @Dario – Yes. It is going to mean a lot more work for me. I won’t go into that…! @That Girl – Welcome. But I’m not sure about Threesomes. We’ll see what Herself has to say. @Deborah – You now have your answer – Offspring has spoken!